"Is that a real fire?" "Are you really going to eat that?" "Aren't you hot in those clothes? 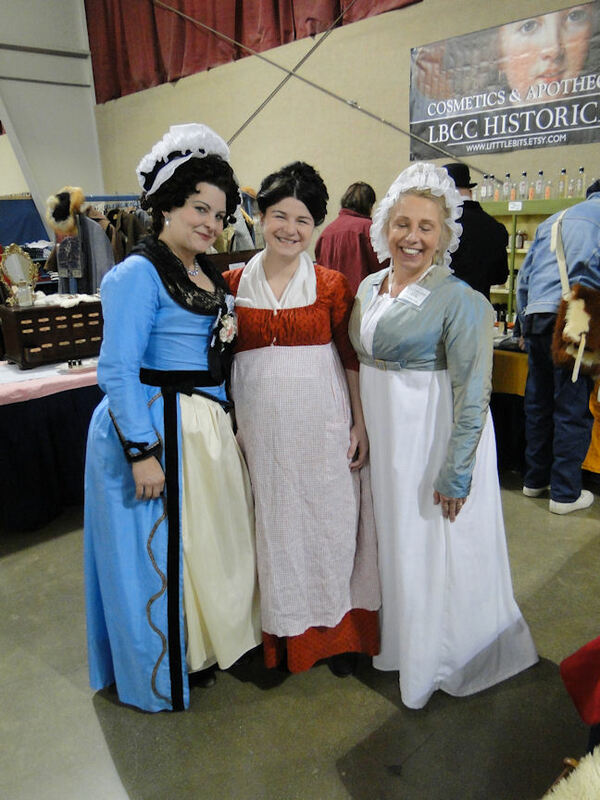 These are probably the top three questions that we, as reenactors, get asked by visitors, wouldn't you say? 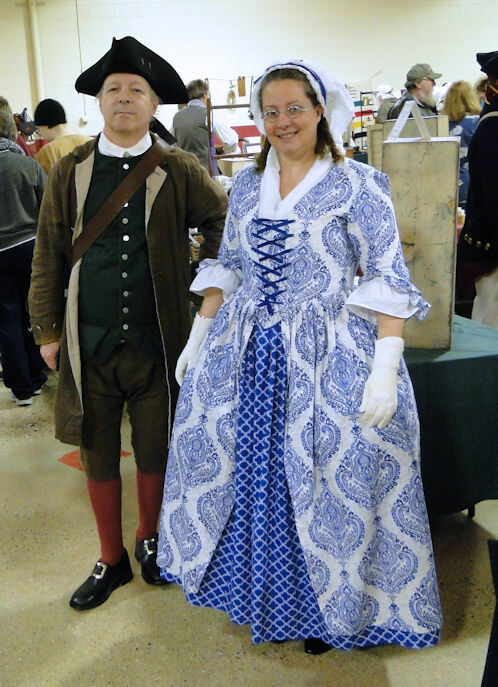 "Where do you get your 'old-time' clothing (or, ahem, costumes) and historical accessories?" Yep...that query certainly is brought up often. 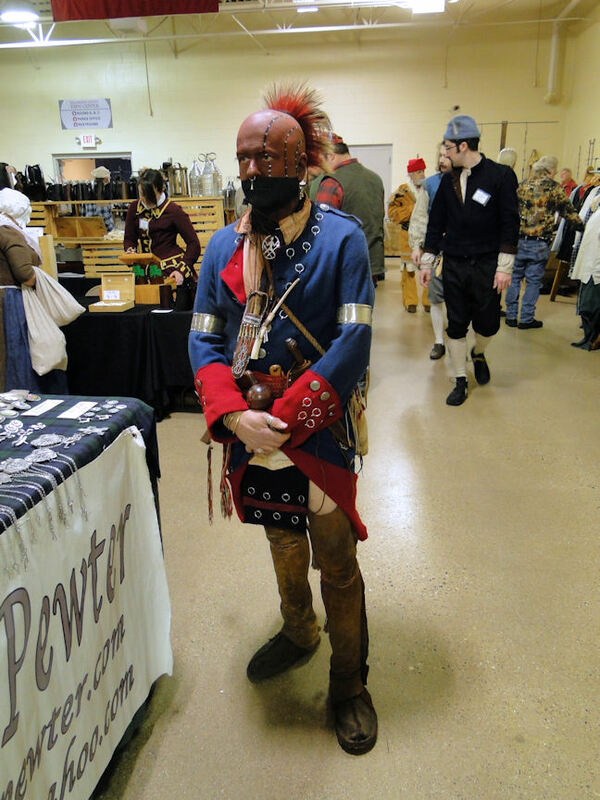 I also hear now and again that many reenactors are leaving the French & Indian War, Revolutionary War, War of 1812, and the Civil War to head forward in time to the 1940s and World War II. I have been told that people aren't interested in bringing the distant past to life, that it takes too much time, work, and research to do so. 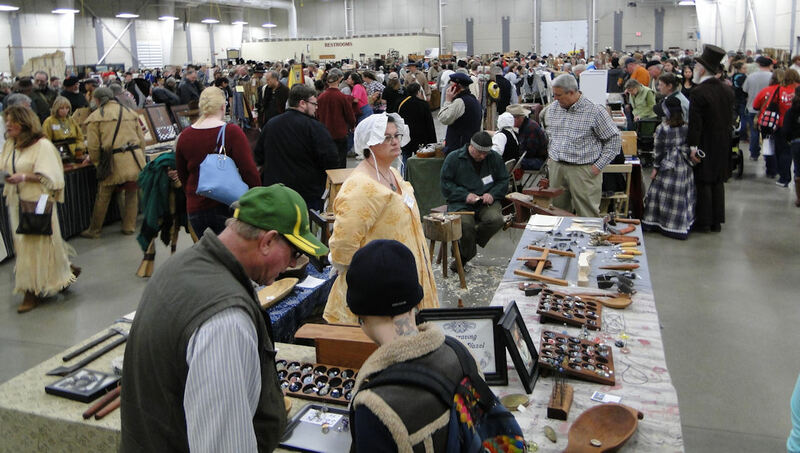 Well, judging by the upwards of 10,000 living historians who made the trek through rain, sleet, and snow to the Kalamazoo Living History Expo, I would say the reports of the death of reenacting pre-20th century America are greatly exaggerated. 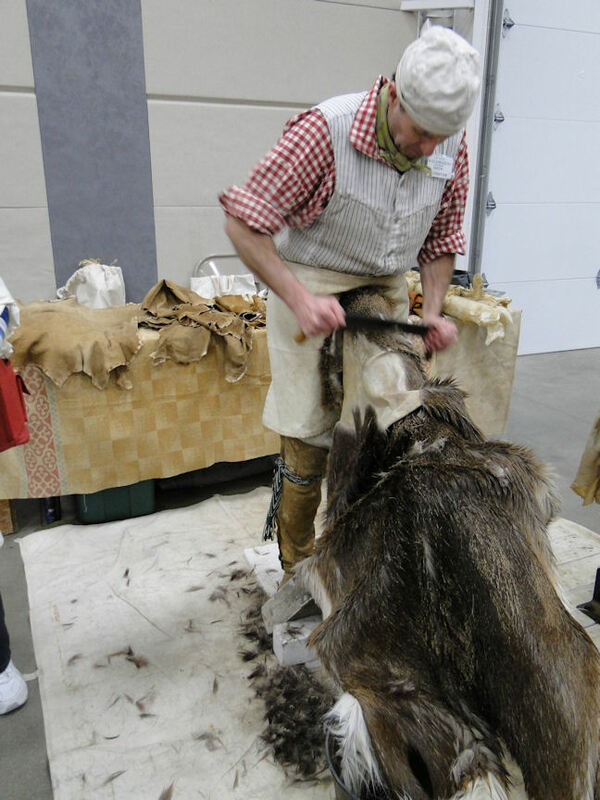 From where I live just north of Detroit, it's almost a three hour drive to the city of Kalamazoo where the living history show is held. 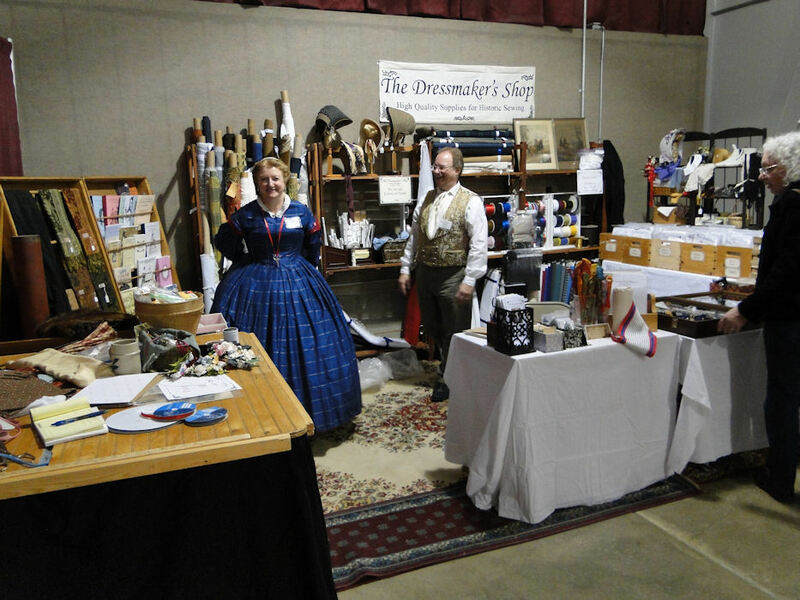 Nearly 300 of the finest artisans and vendors of pre-1890 clothing, supplies, and related accessories and crafts from throughout the United States and Canada come together to sell their wares to those who practice the art of living history. 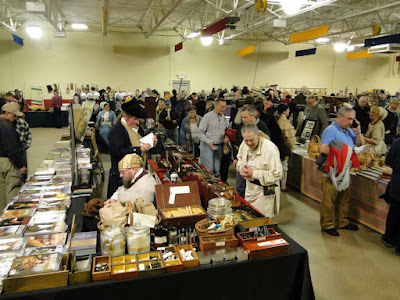 Most of the items found at this exposition centers from around the French & Indian War era (1754 - 1763) up through the time of the Civil War period (1861 - 1865) and everything in between, and all of this takes place inside three very large halls/rooms. My friend, Susan, and myself. 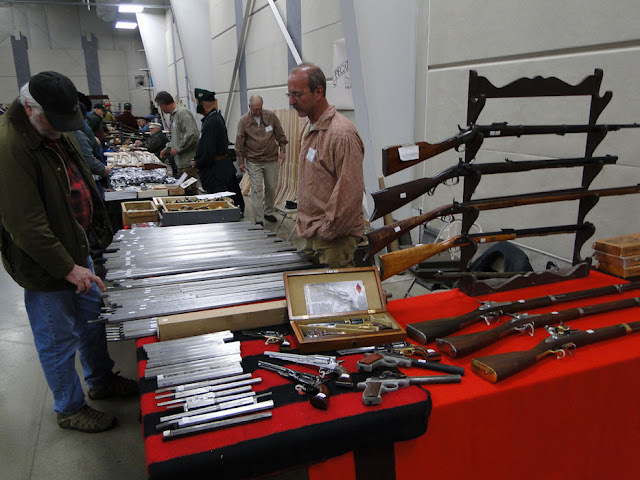 Since I have most of what I need for reenacting the 1860s - I've reenacted the Civil War for over a dozen years - my purchasing priorities tend to be more 1770s. And there is plenty of everything for those of us who are interested in that era. 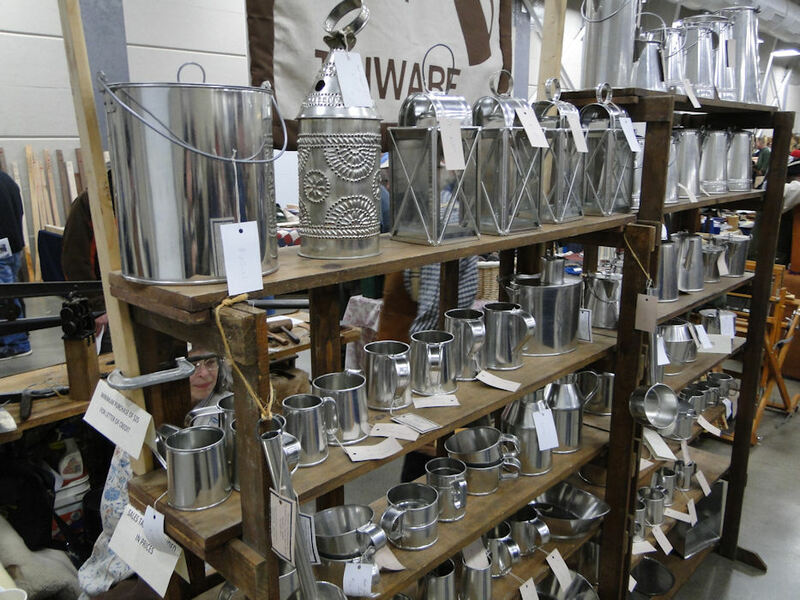 One must remember that there aren't many places we can go to that specializes in the much-harder-to-find colonial accessories to the extent the Kalamazoo Living History Show does. Hence, the reason why over 10,000 people attend every year. It's been a few years since I've worn my period clothing here, but a friend kind of convinced me to do so...so I did. I received many kind comments, and even a few tips, of which I am always grateful for, as long as they are given in kind. 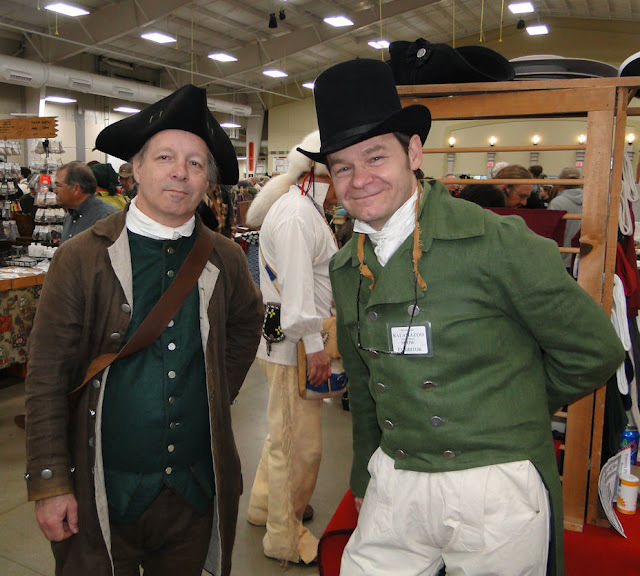 The other reason why I wore my colonial duds was to break in my new shoes. And break them in I did - oh yeah, my dogs were barking after three and a half hours of being on my feet and moving throughout the three giant halls of vendors. Since I have two complete sets of colonial clothing, I can spend more time looking for items either to accent my presentations at reenactments or maybe find a cool "museum piece" for my own home decor. 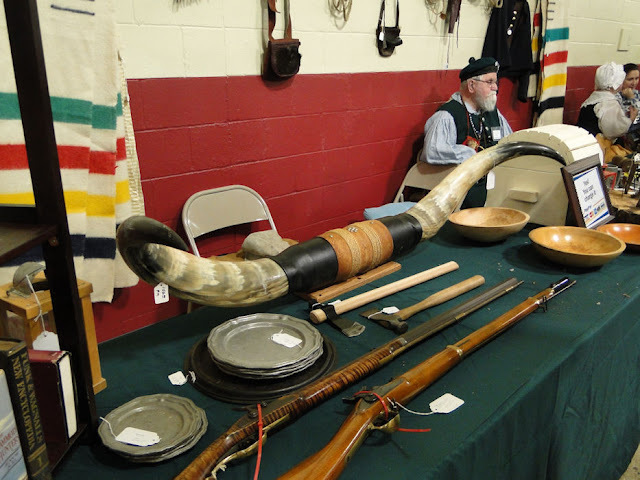 As I moved along the rows and of tables filled with literally thousands of different reenacting collectables, I came across this collection of powder horns. Now, even though I do not own a musket from the Revolutionary War period, I admire the "art" and love the historic presence of the powder horns. Can you guess which one...? 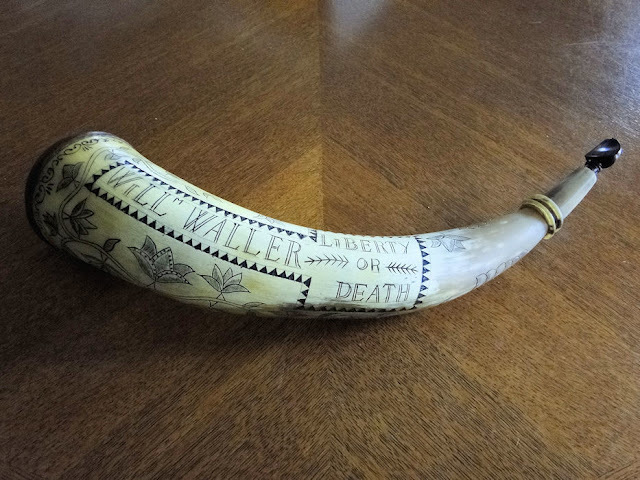 Bearing several popular slogans of the War of Independence, including LIBERTY or DEATH, APPEAL TO HEAVEN, and the sobering KILL or be KILLD, this engraved powder horn was carried by a Virginia rifleman named William Waller, who was captured by British and Hessian forces after the fall of Fort Washington near New York City on November 16, 1776. 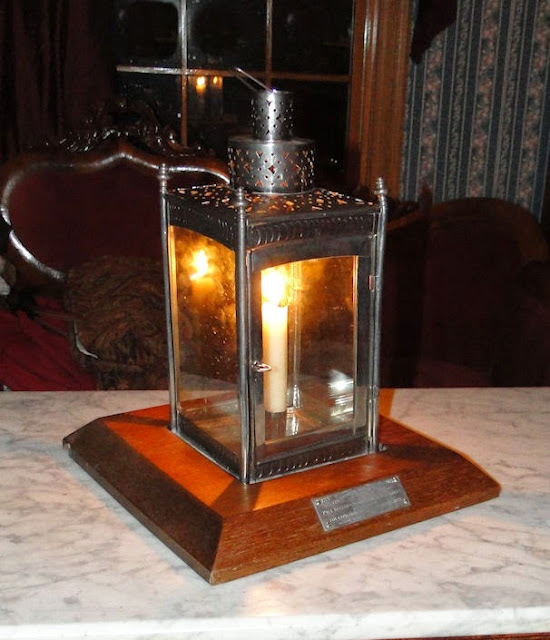 The duplicate lantern made in 1975 by the Concord Historical Society. It's almost like I am creating my own mini-museum of early American history! Why, yes, I am a proud patriot...and love having my history surrounding me. the powder horn was a container for gunpowder, and was generally created from cow, ox, or buffalo horn. The wide mouth was used for refilling, while the powder was dispensed from the narrow point. The horn was typically held by a long strap and slung over the shoulder. 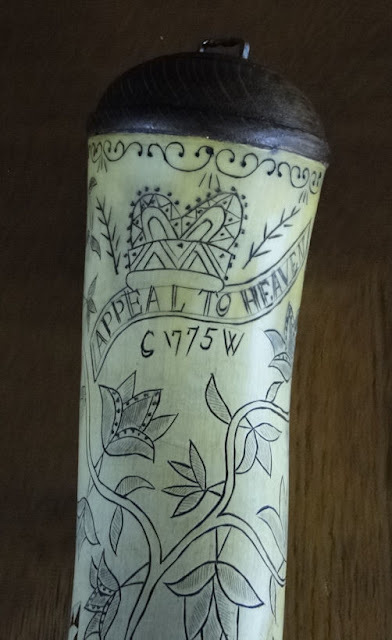 The inside and outside of a powder horn were often polished to make the horn translucent so that the soldier would be able to see how much powder he had left. 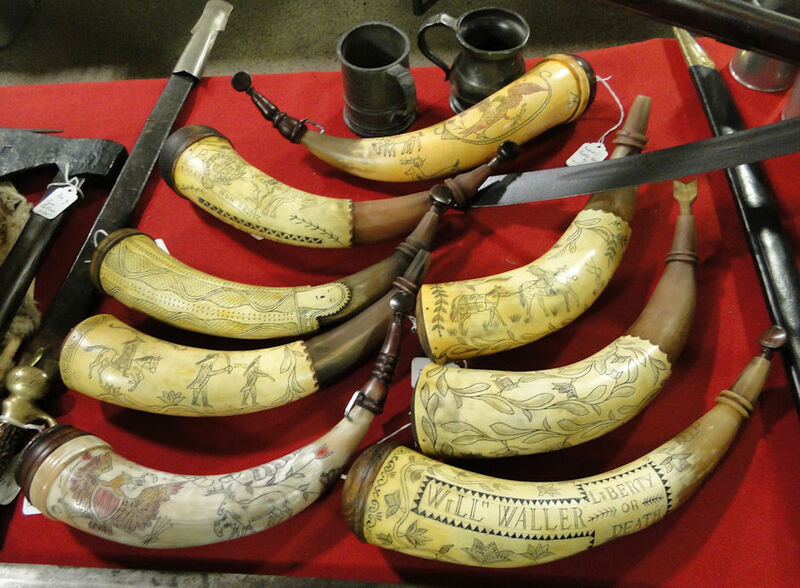 The use of animal horn along with nonferrous metal parts, such as tin, aluminum, copper, nickel, or even an alloy such as brass, ensured that the powder would not be detonated by sparks during storage and loading. Horn was also naturally waterproof and already hollow inside. 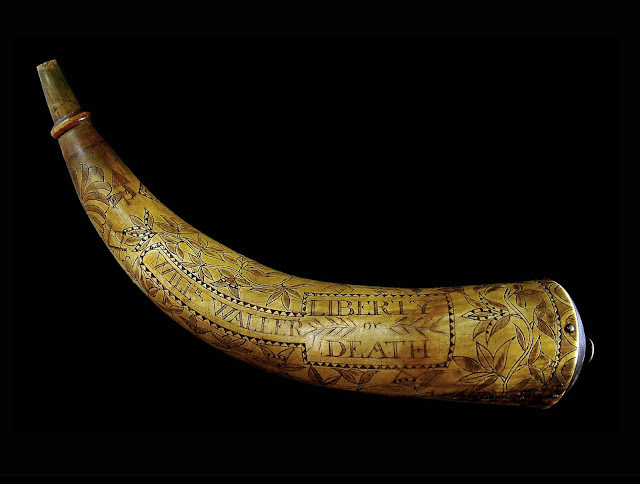 In America, a number of period horns dating from the French and Indian Wars throughout the American Revolution and beyond, have been preserved in private and other collections. 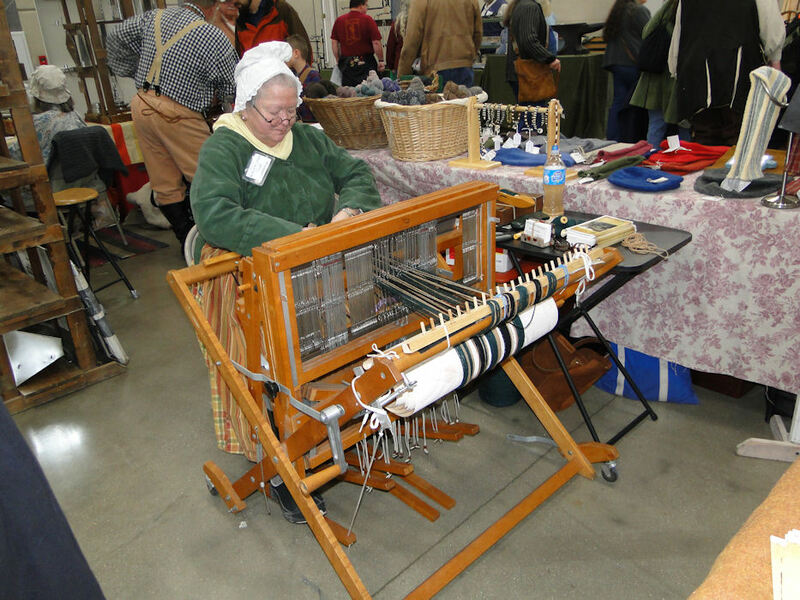 Many decorated examples shed light on the life and history of the individuals that used them, and can be classified as a medium of folk art. which was sometimes supplemented with color. not at the show, I photographed the son in his stead. ...and this photo shows that process being done. 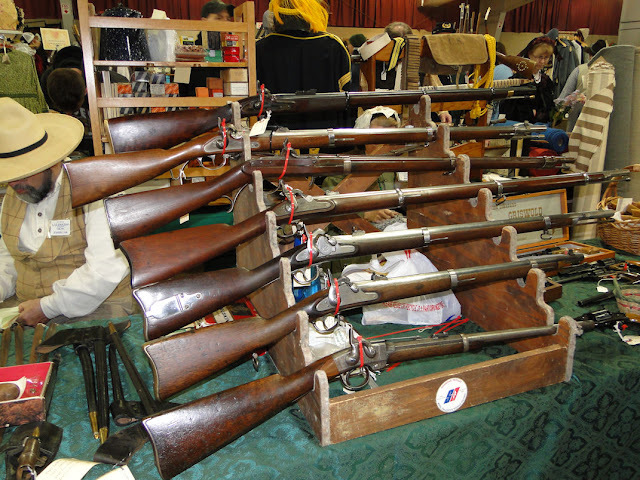 Looking more like toys here rather than the real McCoy, the muskets are not quite ready for the market just yet. Here we see the flint-lock mechanism. And, finally, some finished pieces. Just like reenacting events aren't only about the wars, neither was the Kalamazoo Living History Show. ...including a weaver working on a loom. Here we have a spinner. but I wanted to get a picture of the wheel. 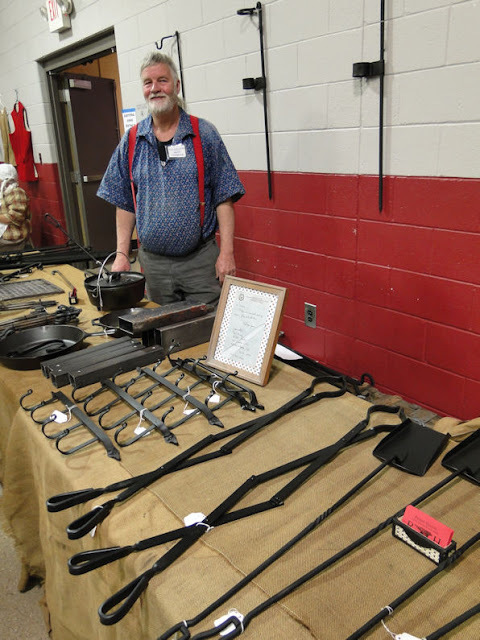 Meet Richard Heinicke the Blacksmith. and is good for most pre-20th century events. This guy was making axes, knives, and other such items out of stone. 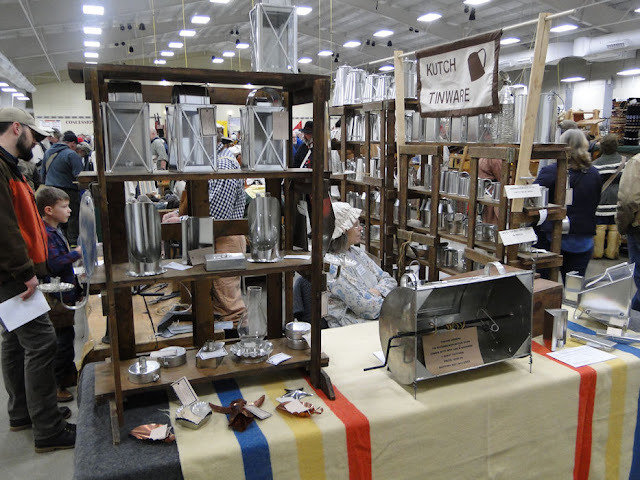 Tinsmith Dennis Kutch was taking a bit of a break when I was in his area, but I normally see him tapping and cutting and bending tin into all sorts of period items of importance. 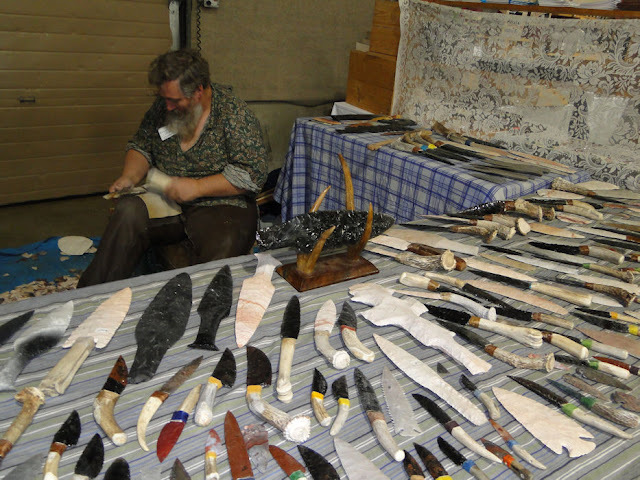 His business, Kutch's Tinsmithing and Blacksmithing from Indiana (e-mail: dkltinker@gmail.com), is always at the Kalamazoo show. Everything you see here Dennis Kutch made by hand. 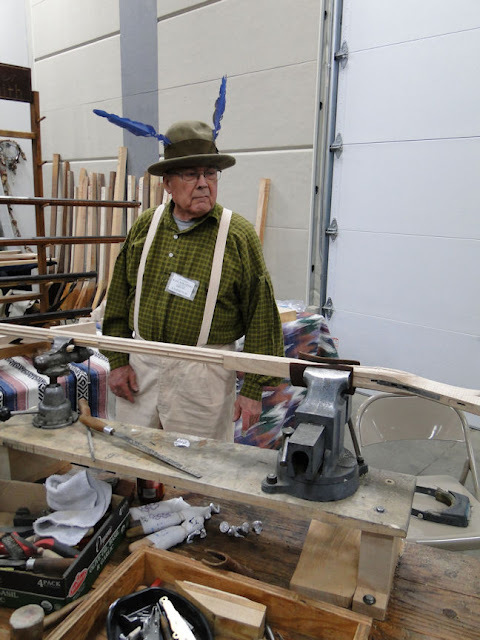 This artisan was one of the most fascinating to me - he was making Windsor-style chairs! Oh, if I could only afford one, but just knowing they were all made by hand tells me the price is worth it. 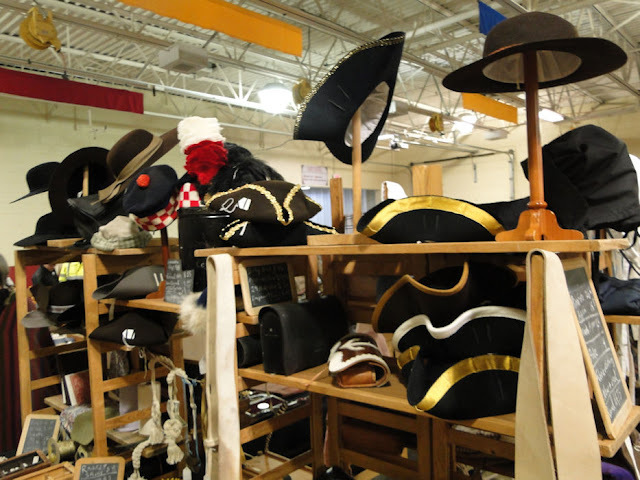 I almost bought a new cocked (tricorn) hat. I watched this woman fold and tie a wide-brimmed hat into the famous 18th century style, but, alas, it was a bit too large to fit properly on my head. 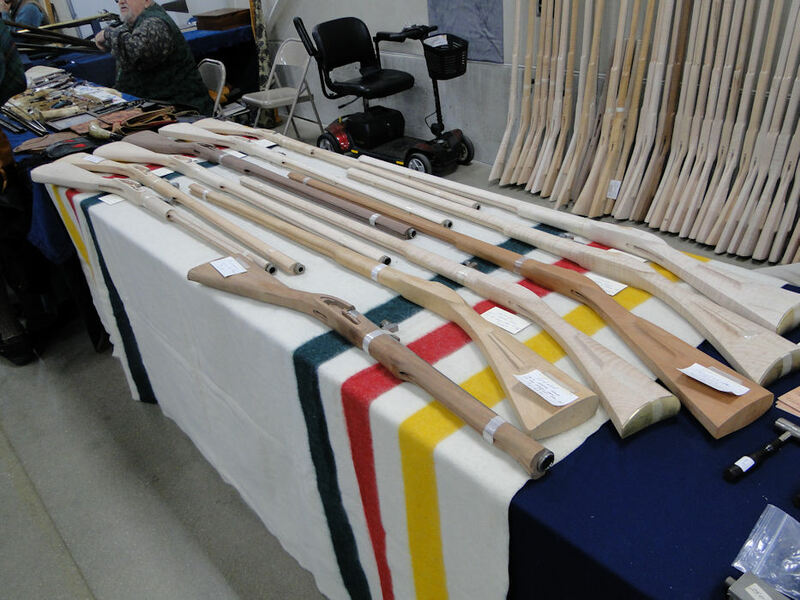 And then there are the vendors. I must apologize - I really should have taken pictures of more of the sellers but I was also looking for items to purchase, too! All three halls were packed with both buyers and sellers! There were, of course, cocked hats for sale, but I wanted one that was brown like the woman in the picture a couple above this one was making. 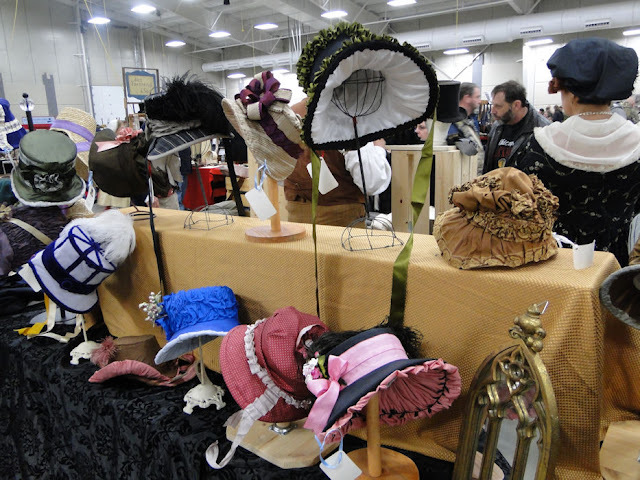 I'm no judge of lady's bonnets, but these look to be Regency or a bit later to me. Here I am with who I believe is the owner of Jas. Townsend & Son, a wonderful place to purchase clothing and accessories for the reenactors of 18th and early 19th century America. (a period apothecary, cosmetics, and skincare shop). She's wearing a 1780s Italian gown. Goods (a Georgian and Regency accessory shop). fashion of the 1810s (Regency era). There wasn't much that a living historian could not buy here. Some vendors carried a variety of items, as you can see here. 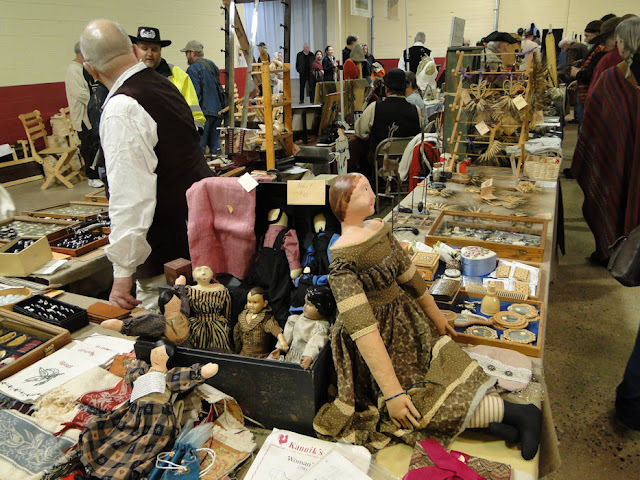 Period dolls amidst everything else. Though you will find a few items that may be "out of time" here and there at the different sutlers, most are pretty on when it comes to the product they have for sale. 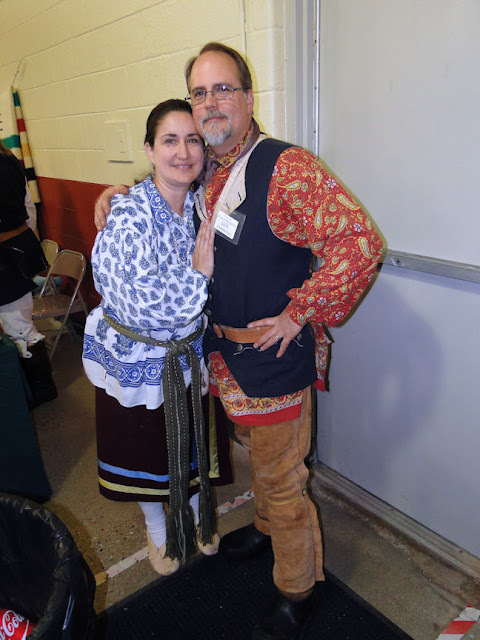 Kim and Jim Lynch, the proprietors, are some of the nicest people in the business as well as in the reenacting community. They can be contacted at the website HERE. who have chosen to take on an additional era. 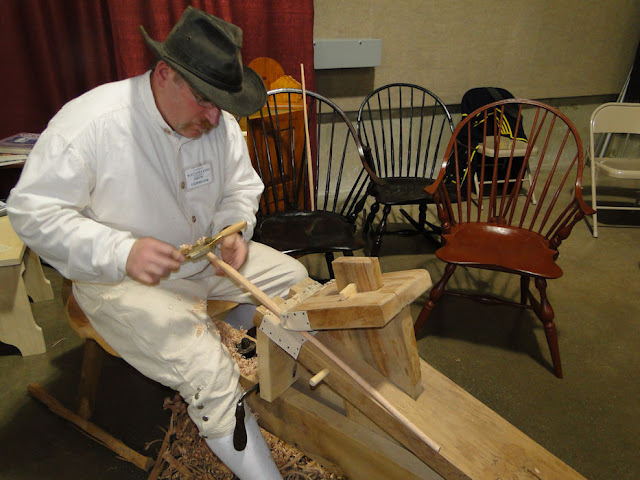 also, at times, reenacts the mid-1700s as well. By the way, check out my new "straight last" shoes! According to their site, in 1757-58 a British army was on its way to attack the French stronghold of Fort Duquesne, later known as Pittsburgh, Pennsylvania. Delayed by the weather, they established winter quarters at the Fort. A nearby creek was used as a refuse dump, and a flash flood in January or February, 1758 deposited a load of clay that sealed the contents of the dump for two hundred years. In 1958 the dump was discovered and opened. 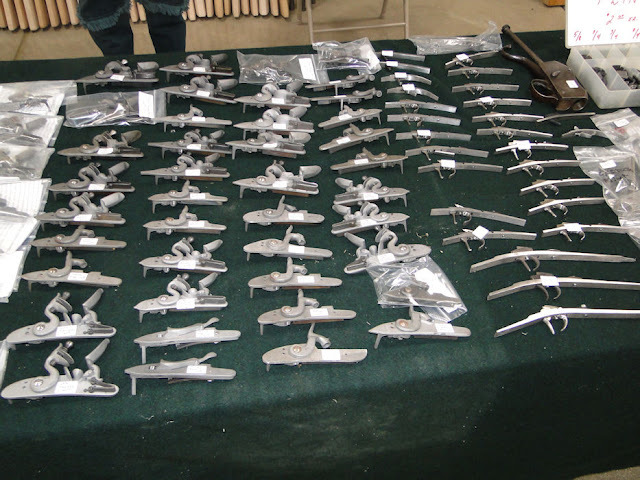 Among other things, a great number of shoes and shoe parts were discovered. Units of that British army had recently been stationed in Bermuda, Ireland, Britain, Philadelphia and Charleston. Their shoes had been made in all of those places, reflecting the supply system of the British Army at the time. The discarded shoes showed fourteen toe styles, an equal number of tongue styles and latchets (straps) from 3/4 inch to 3 inches in width. There were no boxy square toes found there. From the original list, (Fugawee) selected the most common or predominant features. The result was a round-toed straight-last shoe with a low or moderate heel, short tongue and latchets of 1¼ inches. That is the shoe Fugawee makes. 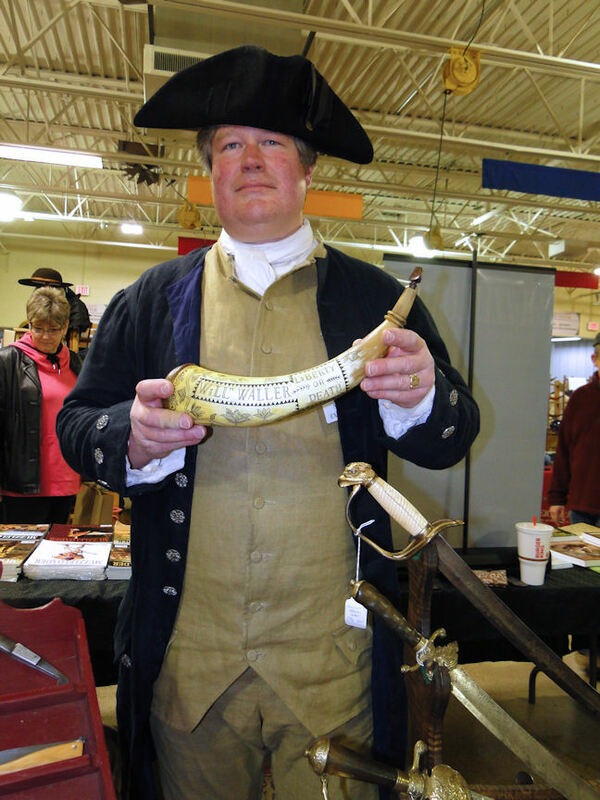 It can serve for a military or everyday shoe from about 1740 to 1800. In Colonial days, leather was brought to thickness by "currying" or scraping over a wooden beam. Now, I have researched this story outside of the Fugawee web site and have found it to be true, which is why I chose this particular style of colonial footwear. 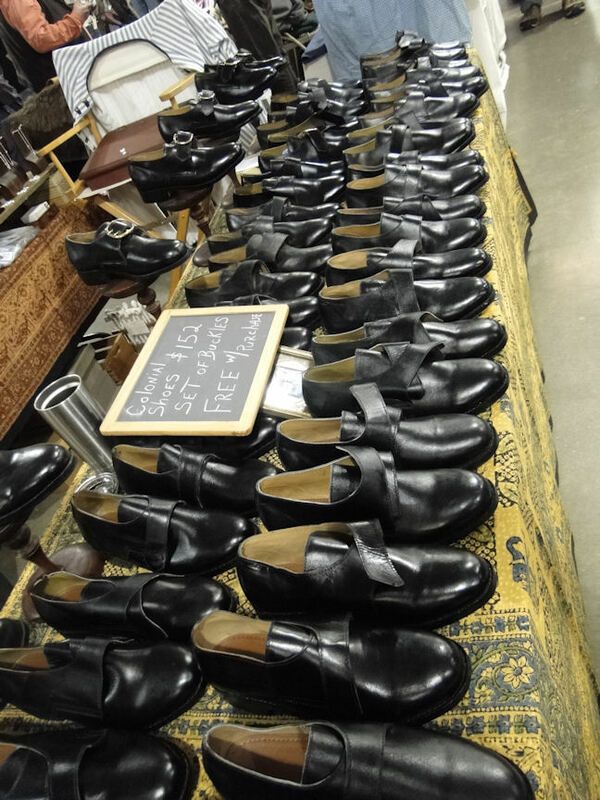 But that's not to say there were not fine shoes sold by the vendors here in Kalamazoo - - it's all preference, you know? this year than last year. 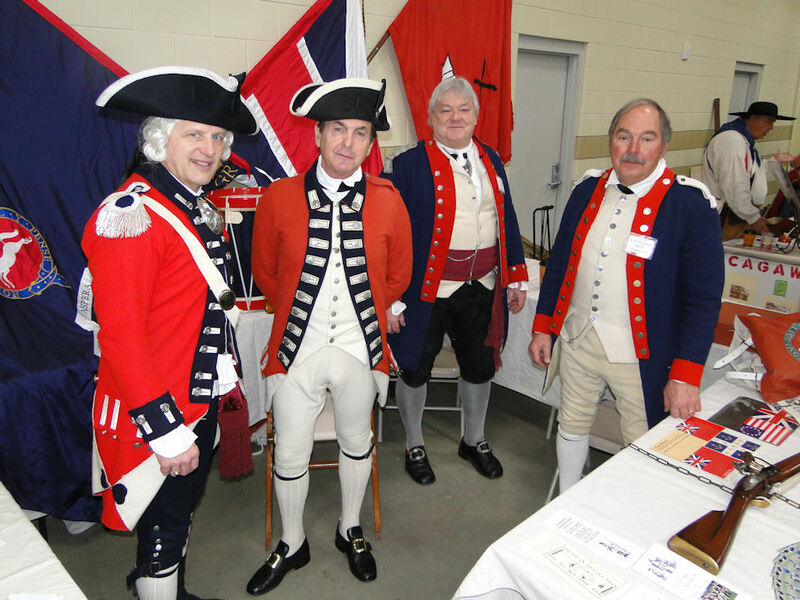 Here we see members of the King's 8th and the 1st Virginia, mixing and mingling. gives off a superb impression. 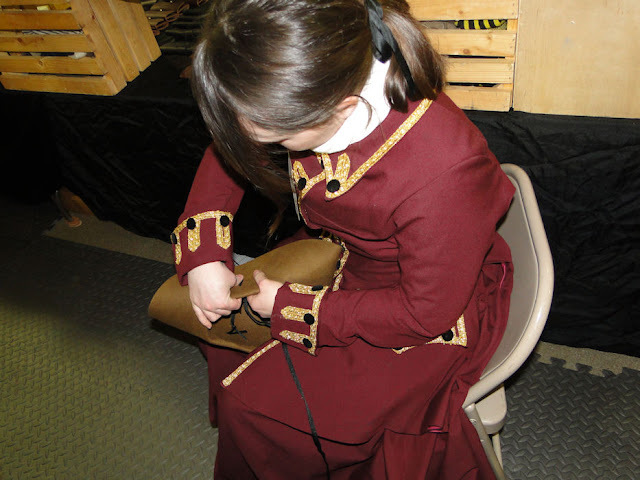 As I mentioned at the beginning of this post, I am often asked where I get my period clothing and accessories. Most people do realize what we wear does not come from a costume shop. 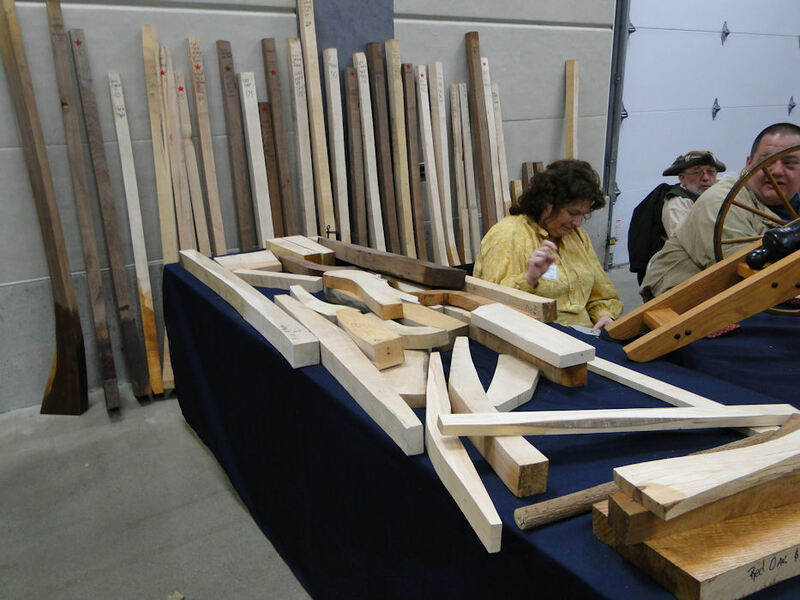 They can usually see that the quality is much higher. 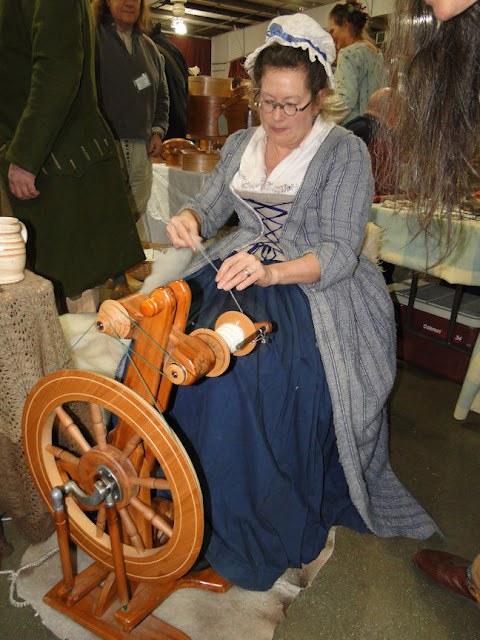 Of course, I do have a variety of answers: the internet, from sutlers at the reenactments, from very talented family and friends, or...from the Kalamazoo Living History Show. I look forward to attending this annual event, which takes place the third weekend in March, and begin stocking my money away months before. Sometimes I have items in mind I want to get while other times, like this year, I go and walk around to see what catches my eye. 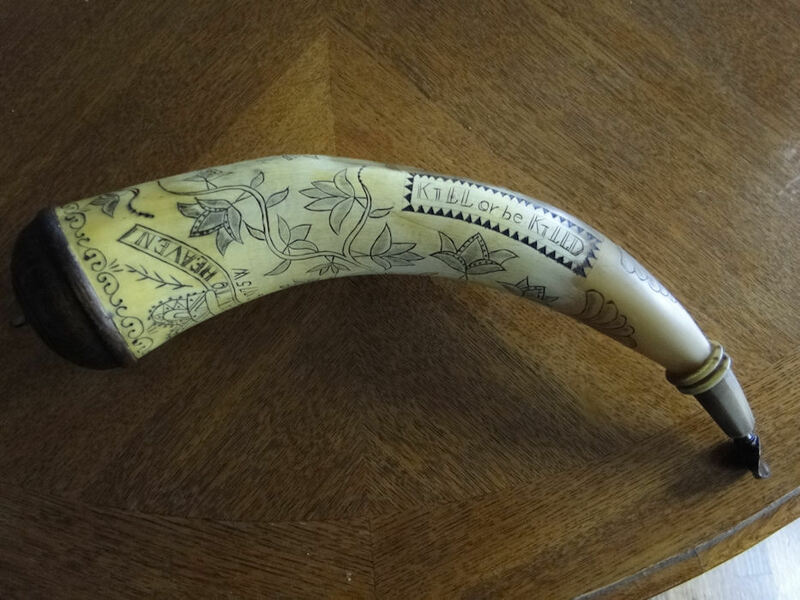 You saw above my main purchase - the very cool powder horn replica. If I had one suggestion, it would be for the clothing vendors to carry a larger variety of sizes and styles. Not everyone wears a size 58, you know. And hats - more hats are needed. Particularly brown cocked/tricorn hats! This aside (and it's a minor aside), the Kalamazoo show certainly is an event worth attending, for if you actively participate in bringing the distant past to life, I would highly recommend you saving your money to check it out, for I've never seen anything else like it. In my packed van of people, I was the only one dressed in period clothing. On the way home we decided to stop and grab a bite to eat at a burger place called Culver's near Battle Creek. 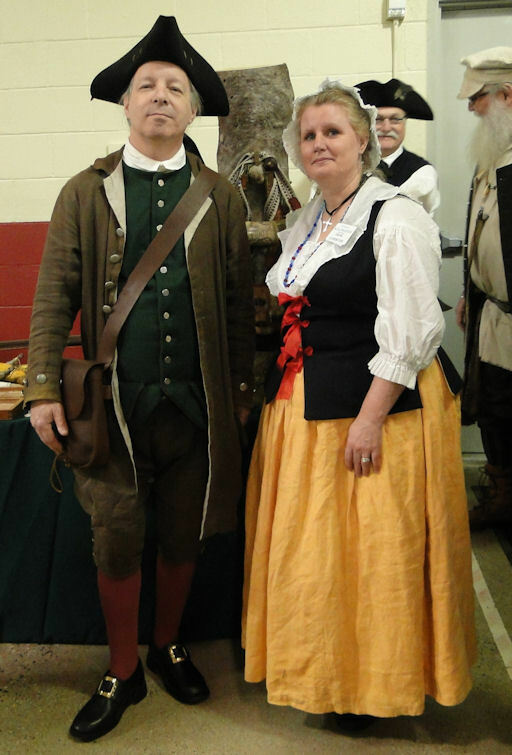 Of course, I was stared at by everyone inside the restaurant, but the girl taking my order acted as if I were in a t-shirt and jeans rather than in 1770s fashions. After placing my order, she asked if I would "like it for here or to go?" I replied with, "I would like to eat it here please. It would be difficult for me to eat while riding my horse." Without skipping a beat, she replied, "I bet it would." Ha! I love this hobby! Please update your email, Ken. I sent you an email. It was returned "Recipient not found." Or you can email me back: ericjames@ericjames.org Thanks. Thanks for posting I felt like I was there!! (Only problem is that I didn't get to buy anything)!!! pout! !